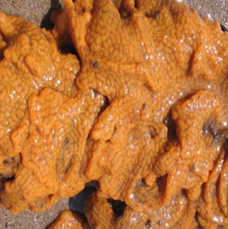 The orange-tipped sea squirt is native to the S hemisphere and was probably introduced here via aquaculture. 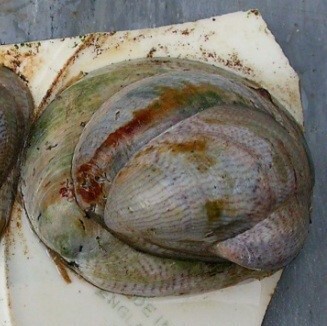 It spread rapidly around the UK after its discovery on the S coast in 2004. 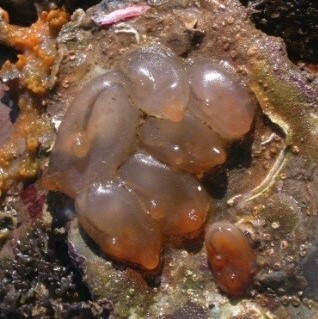 It is a solitary sea squirt, 2-4 cm long, which often attaches to hard substrates such as cobbles, boulders, ship hulls and shells of mussels and oysters. It may threaten oyster and mussel farms through fouled gear and by smothering and outcompeting cultures. Individuals are self-fertile so it can quickly establish and may form dense clumps. 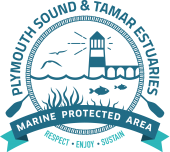 Until recently it was abundant in marinas and on natural shores in the Tamar Estuaries area. However it has become rarer in the area over the last few years.